Happy clappy day. The courier has just delivered my Sew Sew Modern Swap package. I received the most stunning New York Beauty cushion cover, pouch, charm squares and thread pack from Pam (Sewmama123). I had seen a couple of sneak peaks during it's progress, and hoped it might be mine. 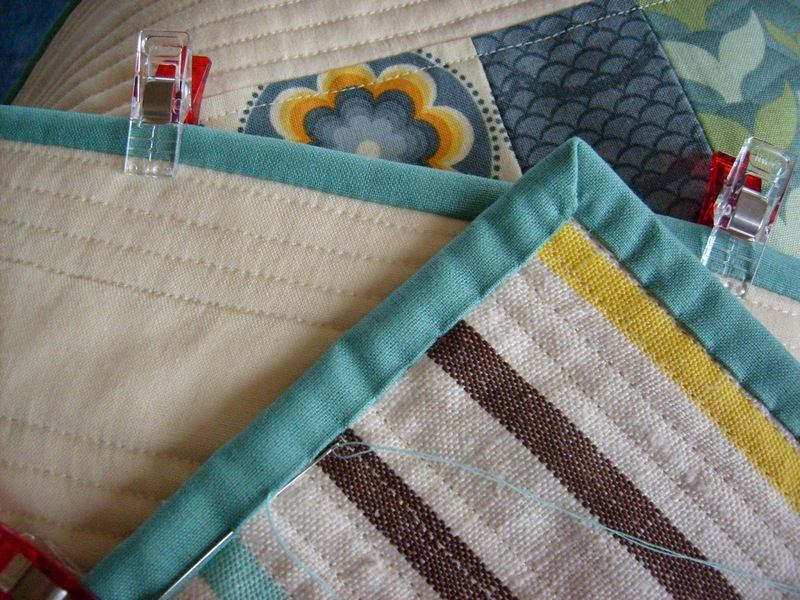 My favourite fabrics, colours and one of my favourite quilting block styles - apparently she found it just as hard to post this off, as I did mine. Luckily I had a cushion inner the right size, so it is currently brightening up my family room at present. One of the benefits of not being called into work on a cold winter's day, is the chance to do a little blog hopping. I found this recipe and decided to try it out. Currently we are just waiting for the icing to set before we can sample it. Not much is happening in my garden at present, however I am so pleased to see that I have Iceland Poppies beginning to flower, these are self sown seeds from two winters ago. I love the splash of colour and their tissue paper like petals. Also with a few flower is this lovely pink and white striped geranium. Sewing for a charity quilt, paper pieced bra pattern from here. A little more playing with scraps was done too. 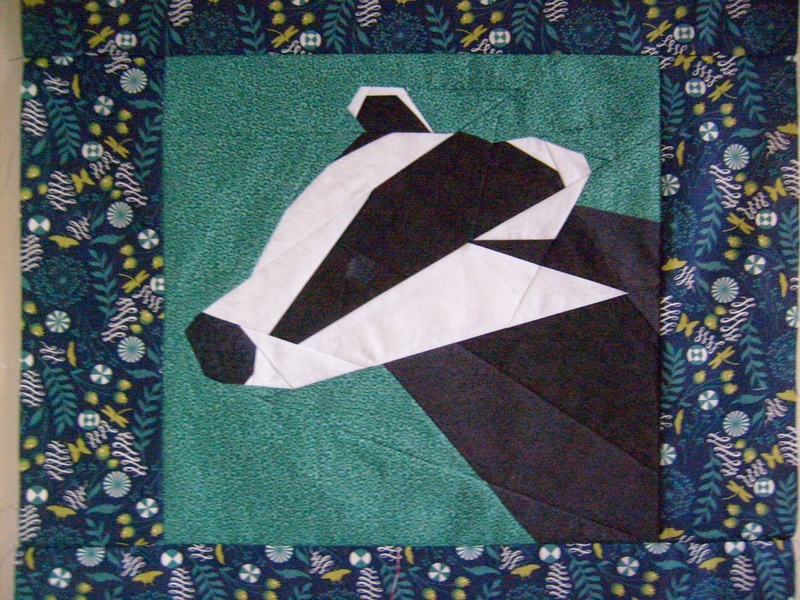 I finished the Badger cushion - one Christmas present crossed off the list. 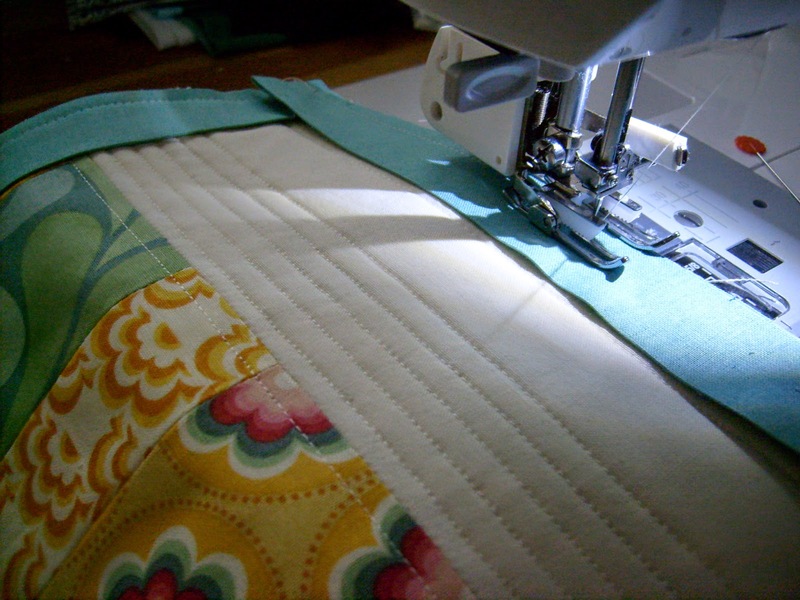 It is backed in the same Tula Pink fabric as the borders, has a concealed zip and bound in another Tula Pink fabric from the same range. They say imitation is the sincerest form of flattery, so I made a block that two of my favourite, most inspiring sewers (Rachel and Amanda) have been making lately. It finishes at about 6"square. If anyone knows what this block is called, please let me know. Cold Glory by B. Kent Anderson. A modern day thriller set in America with a bit of Civil War mystery thrown in. A good read. Sisters of Treason by Elizabeth Fremantle. Another great novel set in the turbulent Tudor period. Honey Mustard and Lemon Sausages. I saw this on Nigel Slater's television show, Simple Suppers, so thought I would try it for a nice warming winters meal. It is cooking as I write this. Yes, after 15 years in Auckland, The Scout and I, have finally been up the Sky Tower. As a last day of the school holidays family outing, we took Miss B and Mr J into Auckland City and ventured up the Sky Tower. At 328m high, it is New Zealand's tallest building. There are glass panels inset into the viewing platform floor at intervals, so you are able to look down as well. We were blessed with the most beautiful fine cold day, so got awesome views from all directions of Auckland and beyond. It is quite amazing how many little parks there are hidden away in the city, and I loved watching the ever changing harbour view. We were even lucky enough to see some brave (mad) people do the Sky Jump. Now that my partner, Sara in the SSM5 Swap has received her parcel from me, I can finally reveal everything I sent her. 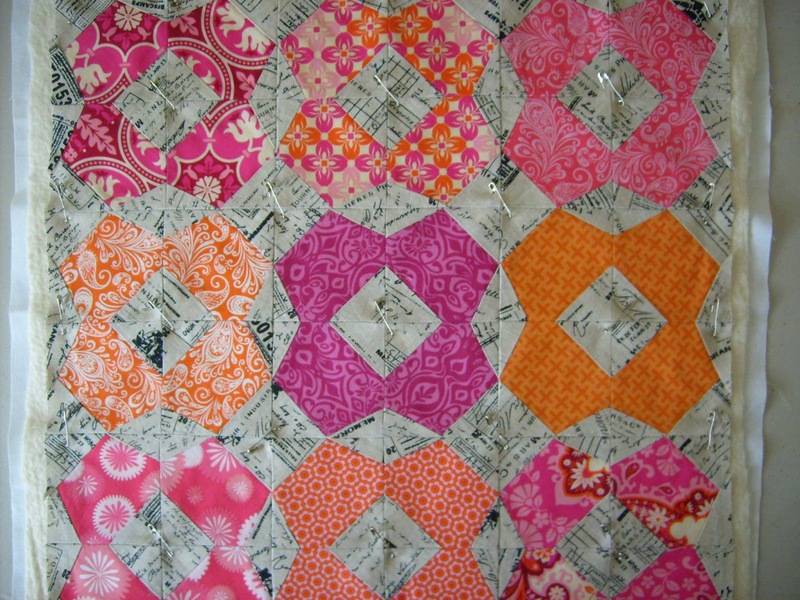 The New York Beauty mini quilt, which was posted about over the last couple of months, was made up of four different blocks from these free patterns. I also included the cathedral window pincushion and made her a hot pad. It was the first time I had sewn with insulated batting before, but I am really pleased with how it turned out, especially all those tiny flying geese. Some beautiful shot ribbons, embroidery threads and zippers which co-ordinated with the items I had made, were sent as little extras. After I got home from the post office, I found the fabric covered 'to do" jotter pad I meant to send her too. In these items I used a lot of fabrics from Denyse Schmidt, Anna Maria Horner, Julianna Horner, V & Co, Joel Dewberry, Zen Chic, Kaffe Fasset and Lizzy House. The beautiful amethyst coloured shot cotton was from Spotlight. I loved how this mini turned out , and am really proud of myself for attempting these blocks. They were definitely some of the most challenging things I gave sewn. I will have to make myself one at some stage. Now I am eagerly awaiting the postie, to see what I receive. Today Miss B, Mr J and I had a day trip to Duder Regional Park. They had organsied a treasure hunt/orienteering activity for the school holidays. It was an absolutely beautifully fine, if somewhat cool day. There was metal detecting, amazing views from huge hills, sheep herding, walking through farm tracks, and tree planting to help regenerate the native bush. Lots of native birds were seen, including the Kereru (wood pigeon) and there were Manuka and Puriri trees in bloom. It was the first time I had been out here, and it was so peaceful and refreshing to get away from suburbia, and see the abundant birds and plants, that these parks protect, so we may all enjoy them. Earlier this year, I made this cushion for a swap, which unfortunately did not really happen. Called Tallahassee Sunset, it is 18" square. 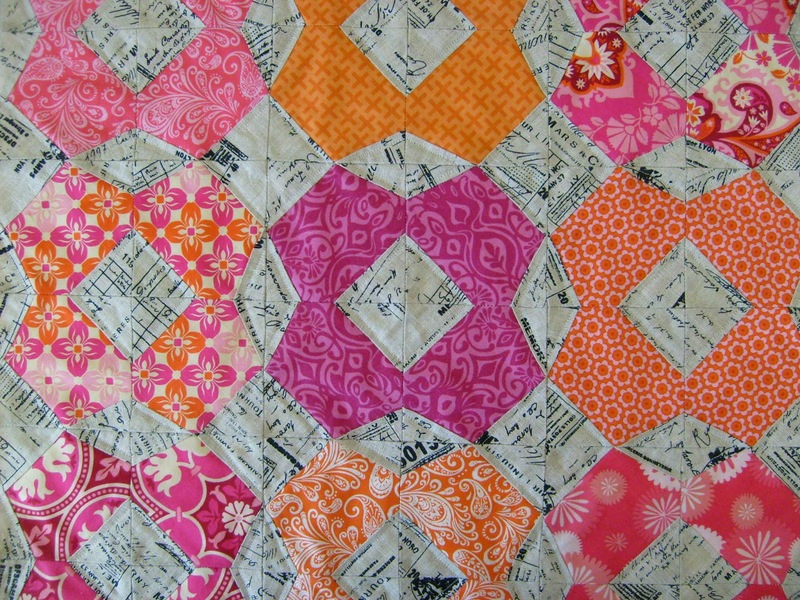 I paper-pieced the blocks from this pattern. The linen text background is from Stof, and other fabrics are from Kate Spain, Joel Dewberry, Lila Ashbury, Doohily Designs and V & Co. 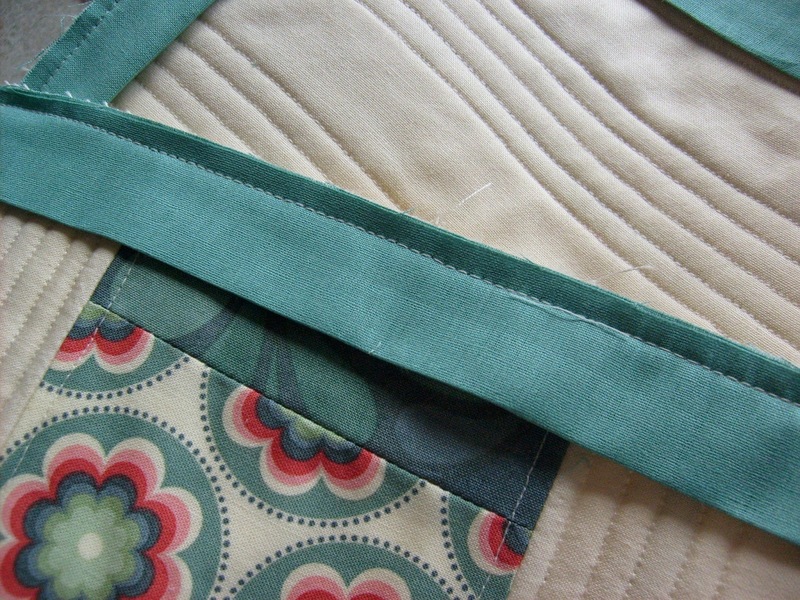 There is a concealed zipper in the back, and I quilted only the linen pieces. 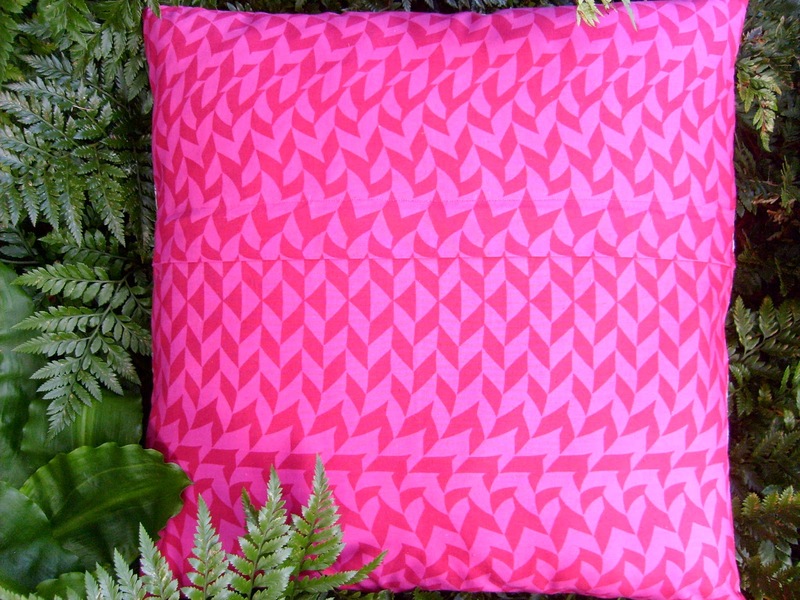 I love how this cushion turned out, and now it will be sent one of my nieces for an upcoming birthday. I spent Saturday working in a different library from where I usually work. It was an awfully wet day, so very quiet for the morning. Part of the problem with working in different libraries, is all the different books I see, that I end up having to take home. 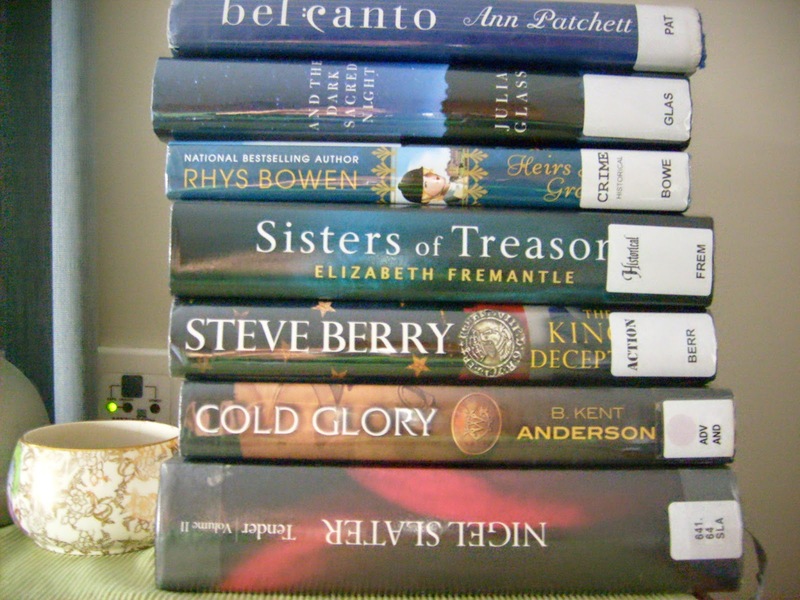 As you can see, my reading pile on my bedside table is rather large. I have just finished reading Bel Canto by Ann Patchett. This was a rather engrossing read, there is some romance, opera, terrorism and suspense, however I was a little surprised by the suddenness of the ending. Worth reading though. I am also reading in bites, Nigel Slater's Tender II, which is about cooking with fruit - lots of yummy recipes, which make me want to dig up my lawn and grow lots of fruit trees. 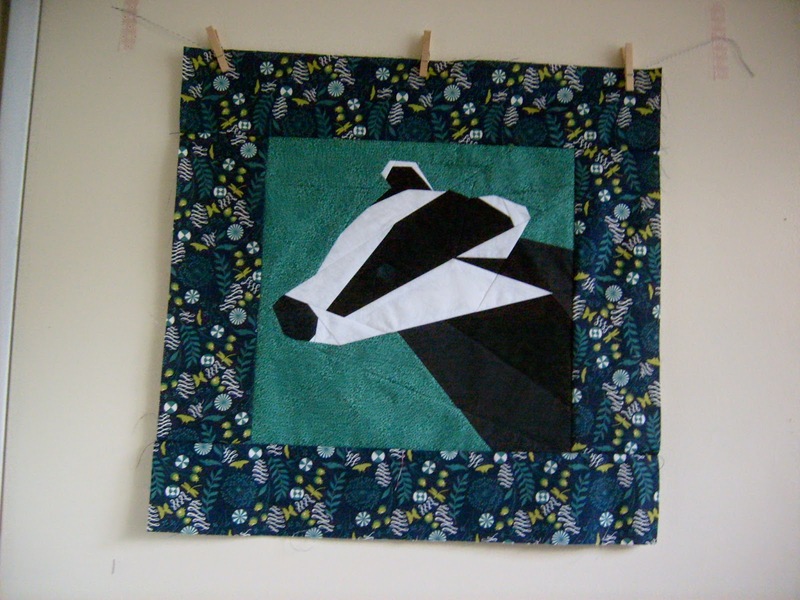 The paper pieced badger has been finished, all the paper removed from the back and a border of Tula Pink fabric added. 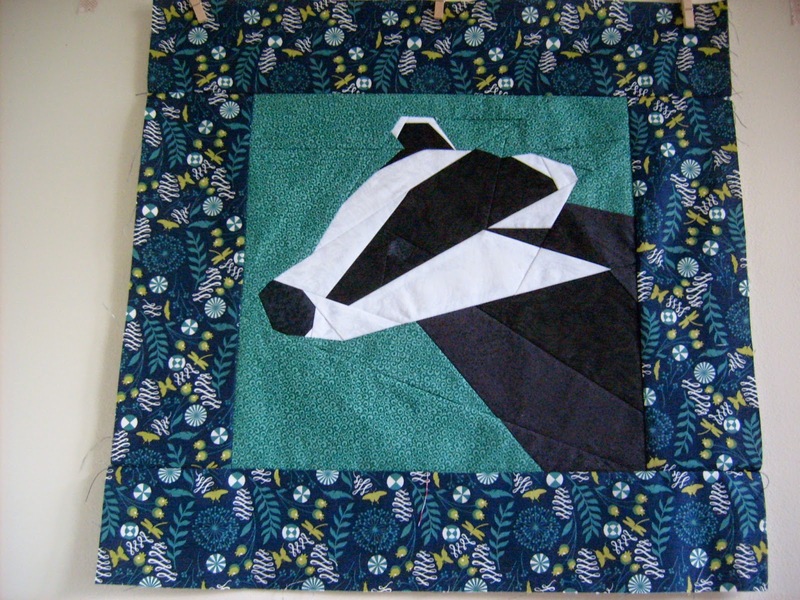 I used this fabric, because the colours sort of reminded me of dusk, which is when badgers tend to come out. In hindsight, I would possibly have used a lighter colour for the eye, but they do have dark eyes in real life. Now just to quilt this panel,and turn it into a cushion, then one Christmas present will be crossed of my to do list. Next week looks to be busy with week two of the school holidays. It is meant to be fine for a couple of days. Miss B, Mr J and I have some interesting activities planned. Hope you all have had a fabulous weekend. In my last post, I mentioned that I was going to finish up some outstanding WIP projects. 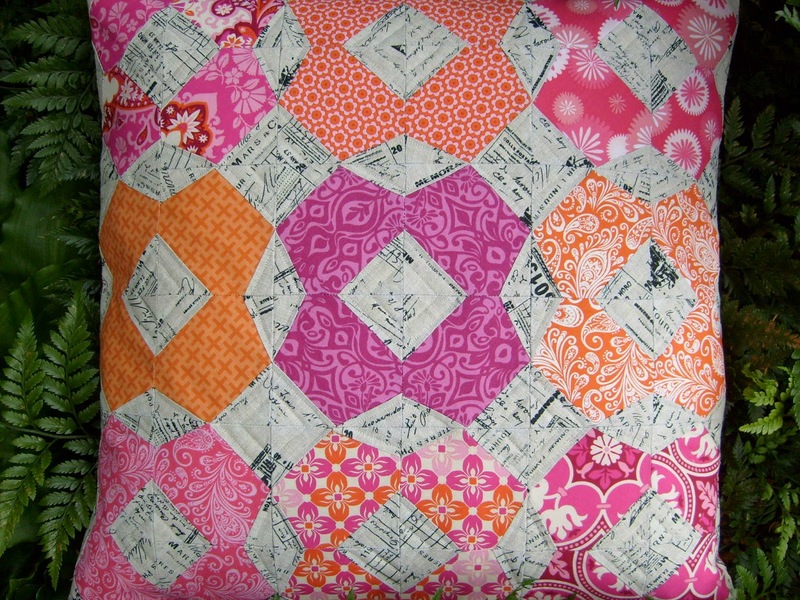 First up, was my mini quilt from the Pack Patch QAL, it is now bound and hanging on my sewing room wall. 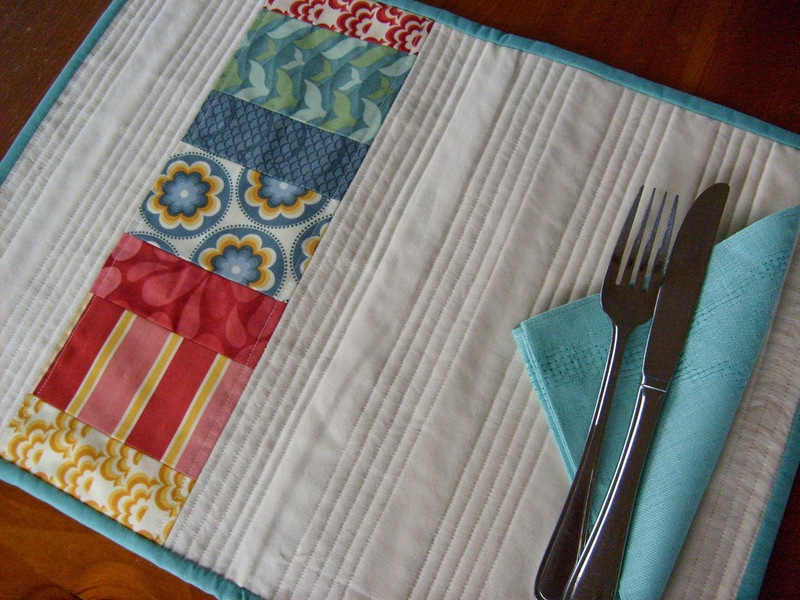 My second finish, were these placemats, which have been waiting for binding since May 2013. Last night and this afternoon, I sewed the binding on. It really was such a quick and easy job for all four. I enjoy handsewing it down in the evening while watching a favourite cooking show or chick flick - and I can't believe I procrastinated so long over such a simple task. 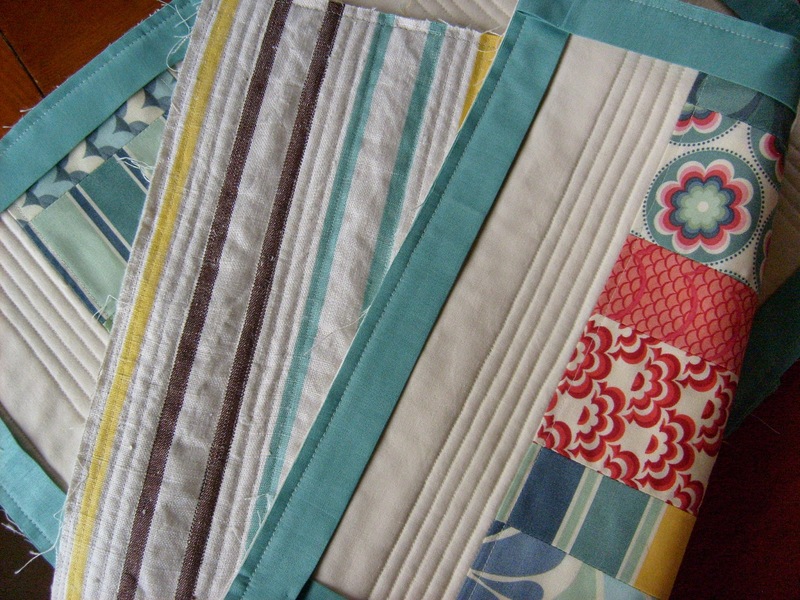 Now we have four new placemats to use. What projects do you need to finish up?